Thanks to Melissa for suggesting this project! 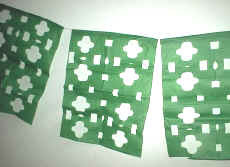 Papel picado (punched paper) is a Mexican	popular art form with roots in the country's ancient cultures. The Aztecs used the bark of wild mulberry and fig	trees to make a rough paper called amatl . Amatl was used to make flags and banners to decorate temples, streets and homes. Today, professional craftsmen use awls, chisels and blades to make	intricate designs depicting flowers, birds, angels, crosses, skeletons, historic figures and even words. They design the pattern on a piece of paper and then cut through it and as many as 50 sheets of tissue paper with their special tools. Sound complicated? Well, never fear... In it's simplest form, papel picado is done as papel cortado (cut paper) and is made a lot like a paper snowflake. Toddlers and up will be proud to display their unique artwork! Fold tissue paper a number of times. It should be folded edge to edge, not corner to corner. For younger children, don't fold too many times or it will be difficult for them to cut. Cut shapes from the paper, but don't cut off any corners (we want the rectangular shape of the tissue paper to remain). Edges may be straight, scalloped, zig-zagged or fringed.